Sun, sand, sea and repeat. That is exactly how I want to be spending my summer holiday but until then, summer in the city it is. And what's hotter than nautical fashion for an urban summer? It makes me feel like I'm under the sun (despite actually being under the grey clouds) and definitely is one of my favourite feel-good summer trends. I've talked endlessly about stripes here on the blog these past few weeks, so when MandM Direct got in touch wanting me to join their "Blogger's Pick" project I was of course more than happy to participate. The trend I picked, out of the many this season has to offer, I hear you ask is: STRIPES (again I know but #sorrynotsorry)! To really put focus on this massive trend and prove how easy it is to wear it on an everyday basis, I created 4 very different stripy looks ranging from very casual to more office appropriate and my favourite has to be the one on this blog post today. Like I said in the MandM Direct blog post (read here), despite being summer in the UK, you can never truly leave the house without an extra layer (I wish that wasn't true but there you go). Enter this gorgeous and lightweight Jacqueline De Yong Stripe Coat (£19.99) that keeps me warm when I need it but not a sweaty mess when I'm in the tube and all windows are closed, for example. The summer coat is a staple for the season, and we all need one in our closets. Ever wondered how to stay trendy for the office? This coat is the answer! Not only does it help you nail that sophisticated look during the week, from work to play, a summer coat in soft shades or prints is the perfect transitional cover-up for a cool look on weekends too. 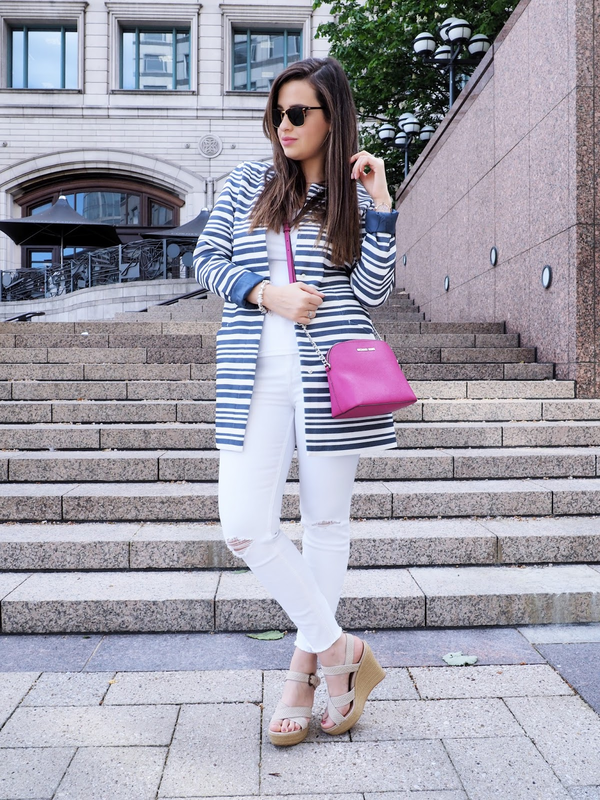 I've featured these white jeans on the blog a few times before but what can I say, they look so damn good with nautical stripes hence the comeback. White goes hand in hand with summer; it looks fresh and light and despite hating white a couple of years back, I currently adore anything and everything in this colour for a more classic look. I love a bit of colour here and there, but lately I have found myself searching for more monochrome pieces and really trying to build a capsule wardrobe. Easy shades like white, black and grey and prints like stripes really simplify things, especially in the morning when I'm barely awake and have to throw something together for work. To finish off the look I chose my trusty UGG Australia Sandals in Pearl (£38.99) which I've also been wearing non-stop as it couldn't be more summery, along with my fuchsia Michael Kors bag which is perfect to brighten up the outfit with a pop of colour. I have tried finding this bag in this exact shade online to no avail. This was an US outlet find but I've linked the black version below. What do you think of this look and the coat in particular? Are you also a massive fan of stripes? Let me know below and as always, thanks for reading beauties! You are so beautiful!! Gorgeous look dear! I love stripes, but the coat wouldn't be my first choice. I prefer my coats to be monochrome (and mostly a little boring) so I get maximum use out of them. And when I say them, I mean the summer and the winter coat, I don't have more. I love your handbag, Nice to give a touch of colour that looks lovely! I love stripes. Period. That coat is TDF Pam. I love this point of pink in your outfit! Love the coat! Stripes are the best! That handbag is so cute too! This is really a lovely coat! Great way to add an elegant touch to a very relaxed look. I'm with you on being obsessed with stripes too Pam, they're so pretty and versatile! Summer coats are definitely a must here in London. I own a few thin trench coats, but I still think they're too long for the Summer. The Jacqueline Coat is perfect though, I NEED!! Definitely rocking that stripe pattern Pam! I love the classy appeal of a good stripe print. Also liking the choice of brightness with the bag - perfect pop of color! I love everything with stripes at the moment - this coat is so pretty! What a beautiful coat, I love stripes and that is perfect! 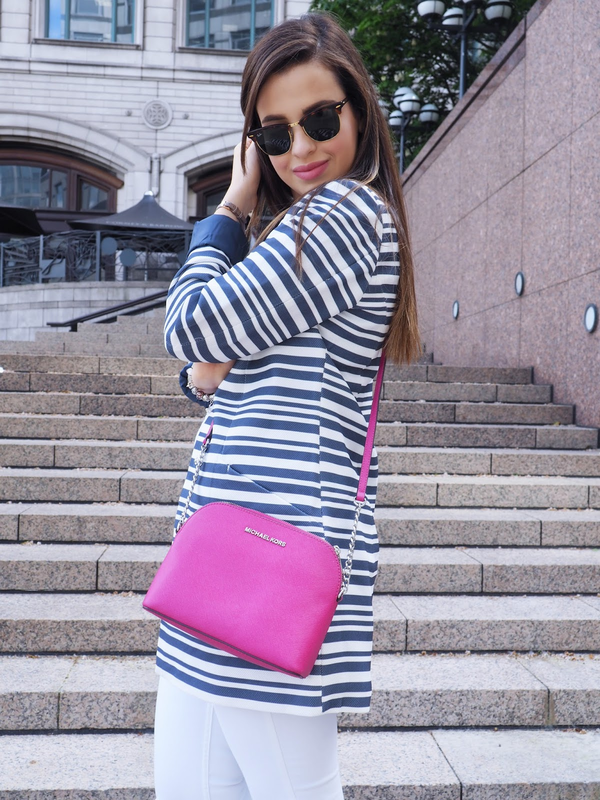 I love the nautical look with the pop of pink - really suits you! I adore this outfit, Pam! I am a huge fan of anything stripe so this outfit screams my name all over. That pair of wedges is from UGG? I though they only make those ugly warm boots. Passando desejar bom final de semana. You are beautiful and I loved your post! Congrats, your blog is everything and more, and yes, I'll come back to visit it! I love stripes but own maybe a couple stripe pieces. Great choice and the coat is very trendy and beautiful and so are you. Congratulations babe. Dear Pam, you look wonderful in navy stripes. I wish you a lovely weekend! I love the pop of hot pink - normally when I think "nautical" and "summer", I think red, white, and blue but the pink looks fabulous! Love the stripes! I'm always used to wearing black and white striped shirts and stuff, this is different and beautiful for summer! Cute outfit ^_^ i love stripes, i especially love your sunglasses! 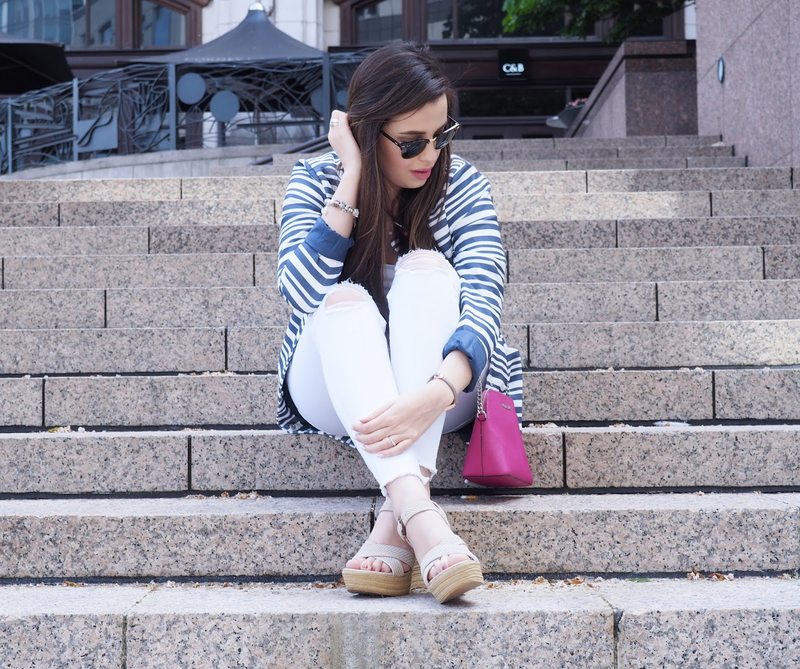 Nautical stripes are one of my favourite trends too! This outfit is perfect for the summer :) Love the wedges and the bag! Nautical style is my fave! I'm a very bif fan of bags from Michael Kors. :) This one is so cute :)! Your shoes are the cutest. Also, I love the stripes on the jacket. You have my style, girl! U Loook so beautyfull and Sweet. I like Ur Outfit. This outfit is gorgeous. Love that coat! Adorei o look - que linda!